Screenwriting in the Boonies: Serpentine, Shel, Serpentine! IF YOU'VE NEVER seen 1979's classic, The In-Laws, do yourself a favor and stock up on popcorn. This is Banana Republic humor at its best. The story starts out in New York, centered on an upcoming wedding—but without any inkling it will end up in Central America, insanity and mayhem. The bride's parents have invited the groom's parents for dinner. If you think you have crazy in-laws, try marrying into a family headed by Vince Ricardo. Peter Falk does such an intense wacko job as CIA agent Vince Ricardo, it makes Colombo look mellow. Alan Arkin as dentist Sheldon Kornpett—the straight man of this inspired comedy duo—could not be more perfect. At one stage, Ricardo urges him to “go with the flow.” Kornpett replies, “What flow? There is no flow” with such acid deadpan you'd swear Alan Arkin was living through the pain of this himself. For me, that was the best line of dialogue in the movie. I even wondered whether Falk and Arkin ad libbed that part or whether the screenwriter was that acute. Either way, these two old-time actors made Andrew Bergman’s screenplay come screaming to life. The line most remembered from this movie involves learning to “serpentine.” It would spoil all the fun to tell you anything about that; you'll just have to rent the movie and see for yourself. 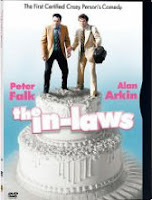 The In-Laws is one of those films that you'll love simply because it’s so preposterous. I love that movie--and never met another soul who's seen it. No one knows what I mean when I say, "Serpentine". This is too cool girlfriend!